Doesn't bother me. It was a pretty worthless poker room. It's closer walking distance to my apartment than even Binion's and Golden Nugget, but I played there just seven times in 5 1/2 years. I stopped in more than twice that many times, but usually found no game going. On the rare occasions that I found a game, it wasn't very good, tended to be short-handed, and tended to break up within a couple of hours. How many times have you heard someone complain that they want to move up in limits where people respect their raises? Well, if you can’t beat the total fish you don’t understand the game well enough to beat people who do respect raises. Poker is a game of adjusting to your opponent. If you’re playing against a guy who has never met two cards that he wouldn’t see a flop with or will call a big river bet just to see whether you’re bluffing, and you don’t adjust your game to exploit that, you really aren’t a very good poker player to begin with. You can bluff into this guy all night long and complain about how everyone on 2+2 agrees with your line or pull out PokerStove and empirically demonstrate that you made the mathematically correct move, but you’re still going to end up losing pots to this guy. Not because he’s a better player than you, but because you’re employing an ineffective strategy against that type of opponent. Stratosphere last night. After a bad start, I had clawed my way back to a little on the plus side, sitting at about $220, when I found pocket kings on the button. Four people limped, then the guy on my immediate right raised to $15. He was absolutely the tightest player at the table, and this was the first time I had seen him be the pre-flop raiser, so naturally I had to be somewhat worried that he had pocket aces. On the other hand, this raise was larger than the table average (which was $8-$10), suggesting something more like jacks or queens. Given his table image and the raise size, I thought that I would probably be his only opponent going to the flop, even without putting in a reraise. I would normally three-bet with kings, but I had not three-bet even once so far in this session (no premium hands), which meant that doing so now would essentially be playing with my cards face up. I decided to smooth-call instead, for dual purposes: It would disguise my strength and it would allow me to see if an ace flopped and re-assess Mr. Tight's demeanor before committing a lot of chips against a player for whom aces were a large part of his range. I think that reraising will win me about $20 most of the time, and lose me the amount of the raise when he has aces, though probably not my whole stack, because this is a player against whom I could fold kings if he four-bets it. I was horrified to see the big blind call, followed by three of the limpers, meaning that six of us were seeing a flop with the pot already swollen to about $90. To use the technical term, this situation kind of sucked. Flop was 9-6-2 rainbow, about as dry and unfrightening as they can come. I was not worried that Mr. Tight had hit a set, though I still had to be concerned that his pocket pair was one pip bigger than mine. Everybody checked to him, and he bet $35. I considered raising, but I was still in the dark about where I stood. I decided to be cautious and see if one of the players in earlier position was preparing a check-raise. I called. Three of them folded, but I hated seeing who did not--it was the trappiest player at the table. As a general rule, the bigger the pot, the more you want to take it down immediately rather than trying to make it even larger and risk losing everything. I think that few players who had flopped a set in this situation would do anything other than either lead-out bet or check-raise. One of the few who would be daring enough to check-call here as a trap--from out of position, against two solid opponents--was this guy. Two pair was unlikely, as I didn't think any hand that could have flopped two pair would have put in $15 pre, and there were essentially no draws, so Mr. Trappy either had a set or one pair. 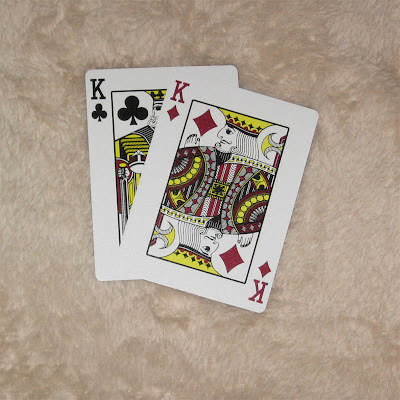 If one pair, it was most likely top pair with A-9 suited, possibly pocket 8s or 7s or maybe even 10s. Fourth street was a four and a second club. Mr. Trappy checked, which didn't tell me anything. Mr. Tight also checked. This didn't tell me much, either. Certainly with A-K he might have taken one shot at the pot on the flop and then shut down. But he could easily do the same with A-A or any other big pair. My table image was solid. I had never shown down a weak hand, and had hit two flopped sets and one flopped boat on my way back to even, all of which did get shown. Mr. Tight might therefore very reasonably fear that I was the one slow-playing a monster and check even aces. I definitely needed to bet here, both for value and for information, but I didn't think it needed to be large. I settled on $50. Mr. Trappy pondered a long time, but finally mucked, which relieved most of my concern about this hand. Now it all came down to whether Mr. Tight had aces or one of his few other possible holdings. He thought a while and then called. Again, this didn't sort out the situation much for me, except to rule out A-K. I was either one rank behind or between one and three ranks ahead (or, as an outside possibility, tied, with him holding the other two kings). His range was now almost certainly down to one of the top five pocket pairs, and I was beating three of them. River came an offsuit queen. I mentally winced a bit, because of the obvious possibility that Mr. Tight had just gone from loser to winner. He checked, with noticeably more hesitation than he had exhibited on the turn, which further fueled my anxiety. Now to me--check or bet? I decided that there were still twice as many hands with which he might well pay off a smallish value bet (namely, jacks and tens) as there were hand with which he would call and win (just aces), so I pushed out another stack of $50. He mucked within a few seconds. I still can't say with any confidence which pair he was throwing away. It easily could have been aces, though my best guess is jacks, with tens close behind in likelihood. The net result? I profited about $195 with pocket kings, without improving, without showing my hand, against five opponents. I find that rather remarkable. It was, of course, extremely lucky, and the whole thing could have gone horribly wrong in about a million different ways. But none of the land mines exploded where they might have, and I lived to tell the tale. 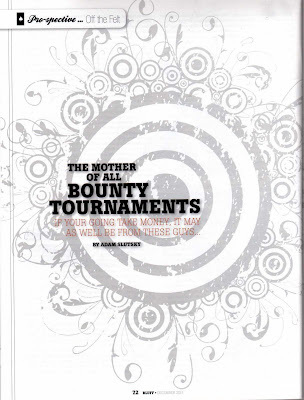 Scott Huff and Joe Stapleton, in Bluff magazine, December, 2011, page 88, commenting on various professional poker players' decisions about where to relocate outside of the United States in order to be able to continue playing online. Aguiar, Deeb, others -----> Mexico. Uhhh, is it just me, or does this sound like an accident waiting to happen? In Mexico, you can get kidnapped and ransomed if you're suspected of having an abundance of unused Tower Records gift cards. What the heck is going to happen when a country that has a pretty disproportionate gun/job ratio finds out a bunch of Vitamin D-deficient supernerds who keep massive amounts of cash on them--and who have the ability to transfer large sums of money electronically--live in that ridiculously lavish high-rise over there? You know, the only building you can see no matter where you're standing in the barrio? Jennifer Tilly, in Bluff magazine, December, 2011, page 76. Sometimes I wonder if I am a compulsive gambler, and then I realize I am not. If I am losing, I quit because I hate losing. If I'm winning, I quit. I like to quit while I'm ahead. Phil [Laak] is the exact opposite. If he is down, he refuses to get up from a table until he is unstuck. Conversely, if he is winning, he won't get up either because he is on a roll. According to Phil, there is NEVER a good reason to get up from the table. Did you notice a couple of problems with that headline? Of course you did. Unless, that is, you happen to be one of the people in charge of writing and proofreading headlines for Bluff magazine. To them, it would have looked perfect. Notice the subhead: "IF YOUR GOING TAKE MONEY, IT MAY AS WELL BE FROM THESE GUYS." This will sound snarky, but I mean it entirely literally: How do you get a job writing and/or copy editing for a magazine if you don't know the difference between "your" and "you're"? Isn't there some sort of test for 6th-grade-level English competence that one has to pass before getting hired on?